Looking for a sheet to send home that has homework assignments AND behavior? Look no further! 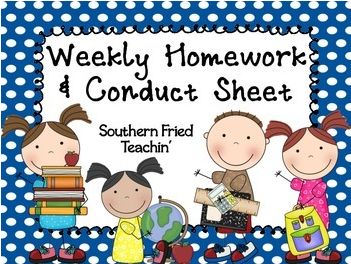 I have used this sheet for several years with my elementary classes, and it worked very well. It was an easy way for students to keep track of their homework assignments and for parents to do a quick check on their child's academics and behavior. I checked them off each morning for the parent's signature. Anything to make our lives as teachers easier, right? If you're looking for a great way to monitor and motivate students' conduct in the classroom, check out my Star Bucks.